Showcase your one-of-a-kind swagger and Boston Red Sox fandom with this Players Weekend Authentic Jersey from Majestic! 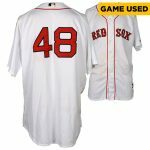 This unique jersey will be a staple in your Boston Red Sox wardrobe with its bold style and embroidered graphics. Its commemorative look will also help MLB build a stronger connection between youth and the National Pastime.